Key difference: The various types of pencils are differentiated on the basis of their nature, hardness and the shades of the lead used to make the given pencils. A pencil is a popular tool used for writing as well as drawing purposes. Pencils were discovered in England, in 1565, where rods of graphite were used to mark sheep while counting, and by 1970, the rods with a wooden covering i.e. pencils were developed. Pencils are made of wood with a graphite core inside, which is actually the combination of clay and finely ground graphite, mixed with water and pressed together at high temperatures to make thin pencil rods. This process was developed by Nicolas-Jacques Conté, a Frenchman, in 1795, and it is still the widely used method by pencil manufactures. By this process, manufactures started to label pencils according to their hardness; they were distinguished into four numerical grades, wherein 1 was for being the hardest and 4 was for being the softest. From the above pencil shade chart, one can say that the pencils differ according to their different shades of color. 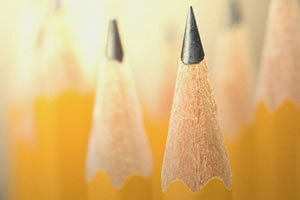 Also, based on the hardness of their lead, pencils are classified into hard and soft leads. Terms such as HB, B, F and H are generally used. Here, the H stands for ‘hard’ which is designated for hard leads, and B stands for ‘black’ which is designated for softer leads. The term ‘F’ stands for fine point. Also, any number in front of HB, or B, or H simply indicates the shade of the lead. Based on the chart, the ‘F’ and ‘HB’ pencils are mediocre in shade with a medium lead. On the other hand, the ‘H’ and ‘B’ pencils are dark and light in shade, with hard and soft leads, respectively. Though, pencils are used for writing and drawing purposes, these grade system help in choosing the right pencil for specific tasks. For example, the middle range lead pencils are generally used for writing purposes, whereas the hard/darker leads are used by artists and the soft/ light leads are used for drafting purposes. Generally, the ‘F’ and ‘HB’ pencils are classified in the same category, as they have parallel properties and are used for the same purposes. Similarly, the ‘H’ category pencils, ranging from ‘2H’ to ‘9H’ have the same properties and uses. Also, the ‘2B’ to ‘9B’ pencil ranges come under the ‘B’ category with matching properties. The differences in their shade, composition and nature of lead between the three types of pencils are given below. Here, the ‘B’ stands for the black nature of the lead. The term ‘HB’ stands for the hard and black nature of the lead. Also, the term ‘F’ stands for fine point. The term ‘H’ stands for the ‘hard’ nature of the lead. It has a soft lead. It has a medium lead. It has a hard lead. It creates a dark to very dark line density. It creates a medium line density. It creates a light to very light density. It is dark in shade. It has a large amount of graphite. It has a large amount of clay. It is hard to erase, as it leaves a mark on the paper. It is hard to erase, and does not leave a mark on the paper. It is easy to erase. It is ideal for bold and thick lines. It is ideal for general writing purposes. It is ideally used for shading purposes in drawing. It is used by artists. It is used by children in school to improve their penmanship. They are used for technical applications such as engineering, drafting, etc.